From January-July of 2006, the LORD burdened one of our evangelists, Jonathan DeSeno, to expand the ministry in the beautiful city of Cape Town, nestled near the Cape of Good Hope, where the Indian and Atlantic Oceans merge. It was there that Jonathan was introduced to Vincent Nkwambi and Louis Conradie. 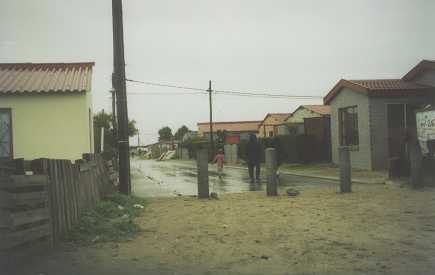 They soon began an evangelistic outreach into the huge “squatter camp” called Khayelitsha. Many heard the Gospel through tracts and open-air meetings, with several professing salvation through JESUS CHRIST. Vincent and Louis are carrying on the ministry there, and they report that sometimes 75 people are attending their meetings, 50-60 of them being young people! Of course we do not know where the LORD may lead us in the days and years ahead. However, because we have witnessed HIS great faithfulness over these past 27 years, we remain confident that as HE wills it, HE will continue to establish, sustain and perhaps even expand HIS influence through us. Our lives and ministry are in HIS hands. Copyright © 2019 “Cities for Christ All rights reserved.” Powered by kirkgee.com.